But before that we had Upper and Lower Canada. Technically speaking the name comes from 1535, from the Huron-Iroquois word for Village usually romanticized as "Kanata". A pair of natives lead Jacques Carter to their village. Who rendered Canada as the name of all of chief Donnacona's holdings. From their the name was applied to everything north of the Saint Lawrence river "rivière du Canada". 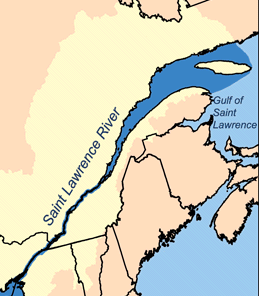 After that it shrunk to just the area around the river and the gulf of Saint Lawrence. 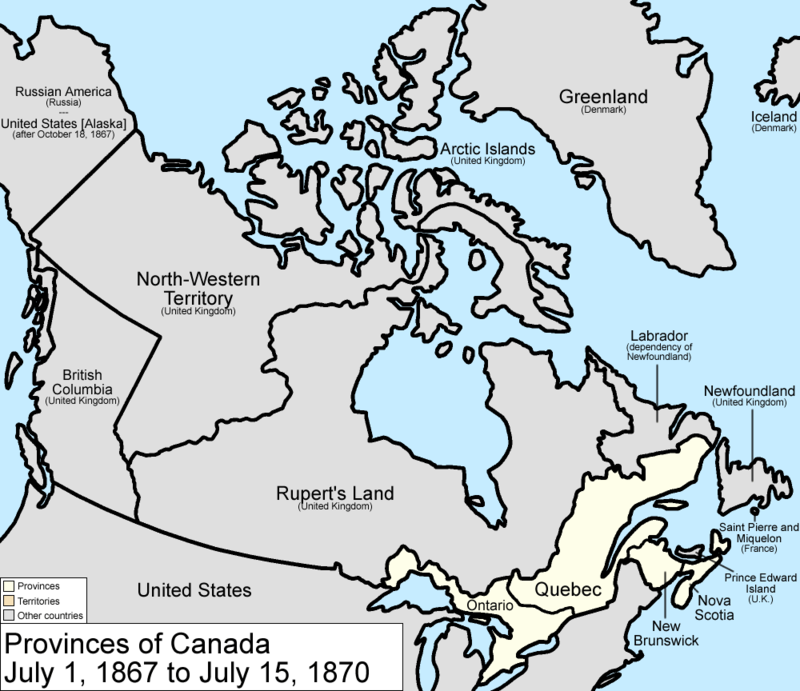 The next use was quite awhile later in 1791 the province of Quebec was split into Upper and Lower Canada what makes this even more confusing is upper Canada is called Ontario in the 1867 picture. I could go into Upper and Lower Canada and why it happened but this post is going to be long enough. In 1840 Upper and Lower Canada were united into a single psedu-nation under British Rule this was mostly because Lower Canada because the French had a majority in Lower Canada and a minority in combined Canada to vastly oversimplify it. 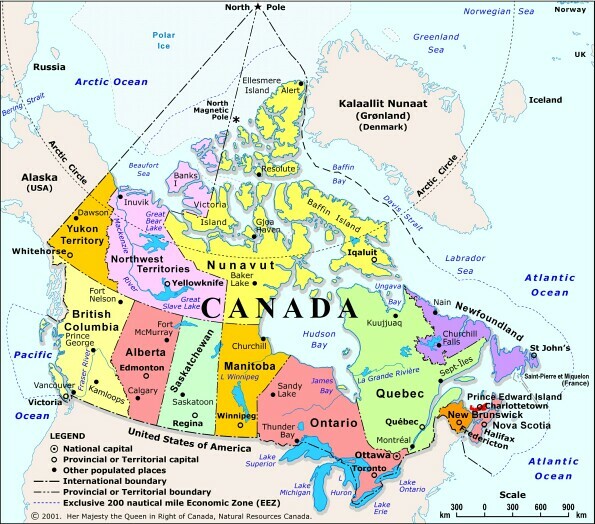 The British North America Act of 1867 established the Dominion of Canada by combining their colonies of New Burnswick, Nova Scotia and Canada. It split Canada into Quebec and Ontario and gave them equal footing in government to the Island provinces. Perhaps the first time in a long history of Quebec being overly politically represented. This consolidation of Government was at least in part to keep the United States from Annexing New Burnswick and Nova Scotia. 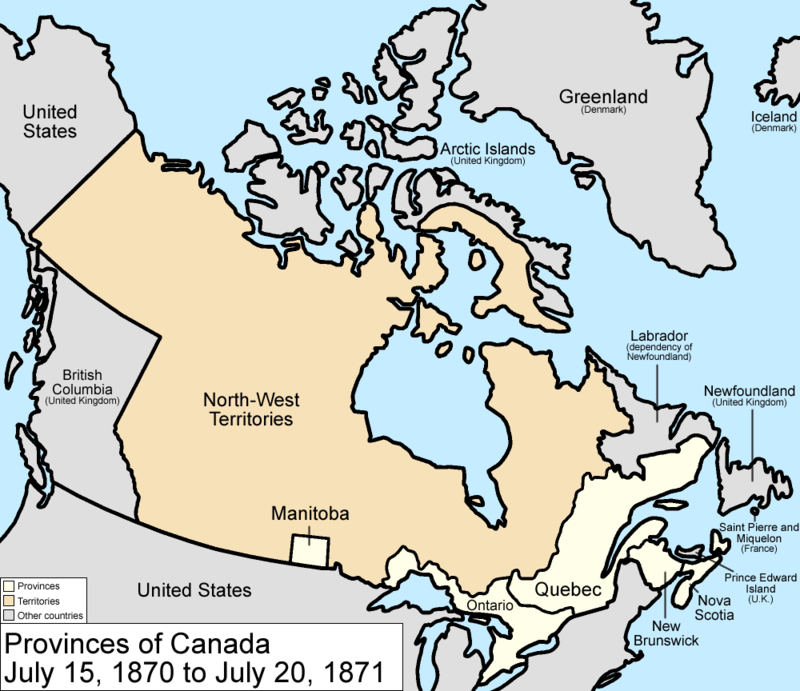 July 15th 1870 the province of Manitoba was created. I could get into a lot of the messed up things surrounding the actual history of Manitoba before it expanded. But here are the cliff notes it got much bigger, it was originally supposed to have combined French and English rights and education. The Métis(Children of natives and french explorers they were big enough to be their own political group) were promised land and rights they were kept waiting with their writs for land and white Settlers came in with a military and drove them and their leader Louis Riel out. They went to Saskatchewan he went to the US. Okay so the Gold mines had dried up and BC was in a lot of debt and had a kind of awful irresponsible government so in exchange for Canada absorbing its debt, giving them a wagon trail across the prairies and some actual representation government BC joined the Union. John A. Macdonald changed it to a railway. 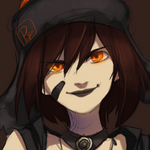 Again I could say a lot more but that is probably enough. July 1st 1873 mostly as a move to keep the U.S. From taking over Canada offered to pay their railway debts and buy out their absentee Land lords. Hey remember when I said the Métis fled here good times its been 35 years since then. Anyway the North West Territories Population was getting to high in some areas for it just have one not all that put together or powerful one. So slowly parts of the Southern bit had started to gain a bit more power become psedu-provincial regions. They were originally just going to make one large province but some dividing lines were already in place so we got Saskatchewan and Alberta. I could expand on any of these but there is a basic Run down of the Formation of the provinces of Canada. Happy Canada Day everyone. Wtf is Canada? Sounds like USA dlc. Happy borbday for the country! Snake wrote: Wtf is Canada? Sounds like USA dlc. A bot bumped this thread, Canada day is on July the 1st.